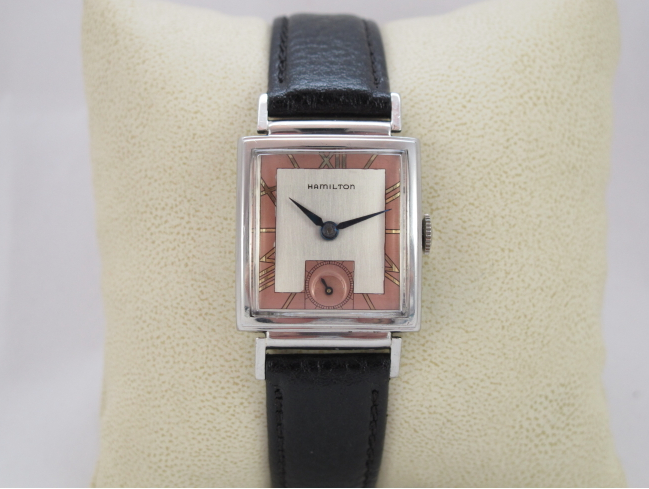 In 1939 Hamilton introduced a watch model that ultimately came in all sorts of unique options. 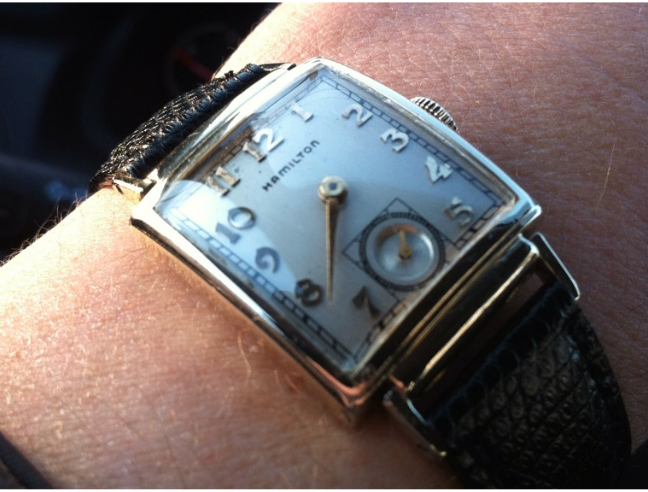 The Ross was produced through 1946 and used both of Hamilton's 14/0 sized movements - first the 980 when introduced and then the 982 after 1940. In addition, the Ross came in three different case materials, yellow gold filled, white gold filled and coral (rose) gold filled. Furthermore, different choices for hands and dials made selecting the right Ross even more of a challenge. In the end, there are at least six different varieties of Ross models to add to the watch stable. In 1940 the Coral version of the Ross was introduced with a 982 movement and two dial options to go with the 14K rose gold filled case. 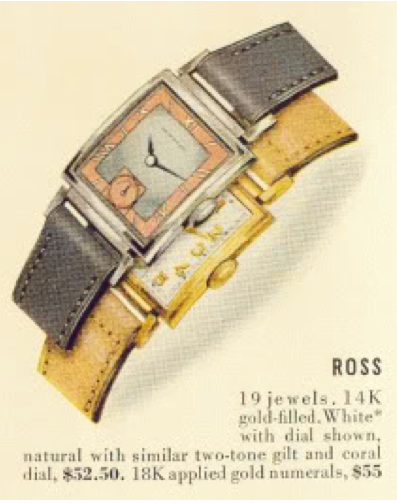 One thing I find interesting about the Ross is for a 1930's model it really foretold a lot of the styling for Hamilton watches in the next 20 years. 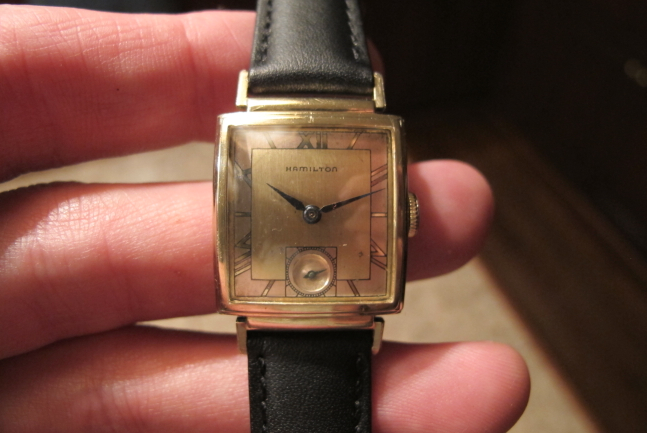 Considering it was discontinued in 1946, at least to my eye, it seems to fit in well with the rectangular watches that were introduced in the late 1940's and in to the 1950's. It's a very sharp design and I especially like the gilt-dialed varieties. 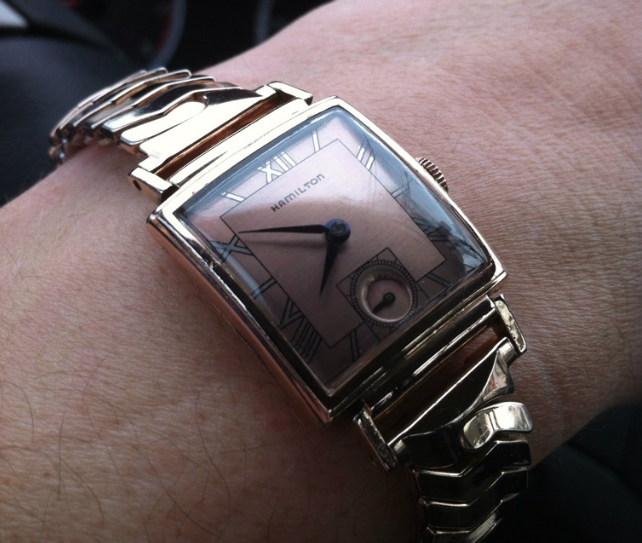 Such a classy watch - you did a great job on mine Dan. It's really interesting to see the range of dial designs too. Not an easy decision at $50 1940 money! They're like potato chips too... hard to stop after just one. Ha ha! The "Ross" may be my favorite single Hamilton design. The variations make the "Ross" an example of the relationship between design and aesthetics. Hi HandyDan. I just came across your blog. I have a vintage Buchanan, in quite poor condition, but still a nice round cushion case that I love, and now I just purchased a Ross in the Coral for my father. Those roman numerals are stunning! In my opinion that's the best iteration of that watch.